All Ages & Levels Welcome. 7 days a week, Narragansett Town Beach, 8am. A mix of Yoga poses, Sun Salutations and power Yoga poses. We are in the sand, between lifeguard chairs #3 & #4. Rain Location: Natural Fitness Studio, 72 Narragansett Ave. 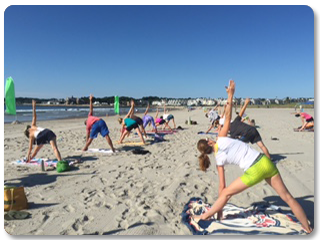 Thank you ALL for sharing and making summer in Narragansett fun. You are always in our Aums. Memorial Day thru Labor Day 7 days a week, Click Here for exact dates. See you Soon! Poses for all levels. Focus on alignment, body/mind awareness, breathing, and press points. Modifications provided; students with knowledge of poses are encouraged to go further. 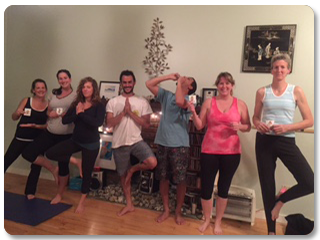 Classes mix Hatha (hold postures), Vinyasa (flow postures), & Ashtanga (power) Yoga. Same as Yoga class above. Heat increases flexibility, improves endurance, and lymphatic drainage. Designed to strengthen personal focus, balance, empowerment and endurance. Room temp 85 degrees. All levels welcome. Focus on poses to target lower back, neck and shoulder pain. Come when you can; it is insurance for years of pain-free Surfing. All are welcome (Surfers & Non-Surfers). Always wanted to try Yoga? No experience necessary. Yoga Basics introduces primary Yoga poses, press points and breath awareness. This class is designed to ease you into Yoga with modified poses and breathing. 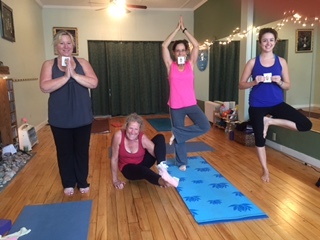 For you, friends, family, workplace – your group chooses the type of class, Yoga, Pilates, and/or Free Weights, the time and date – call for details. Yoga poses and breathing techniques will help you relax, focus, balance school, work, athletics, and everyday life. Instructors encourage students to experience their strengths and capabilities in an atmosphere free of judgment. Call 401-783-9229 to book a Stand Up Paddle Yoga Session!